Craftsy Foldforming Video 2016 order link A workshop in a box. Over two hours of excellent, step by step video, the ability to review any lesson, go to any place in the video, ask questions of Charles and more. Please go to craftsy to join but then return here to buy the class. This makes a difference to the royalty Charles recieves. Charles Lewton-Brain invented fold-forming, a completely new way of forming sheet metal quickly into wonderful 3-D shapes and textures, most from single sheets of metal without any soldering. 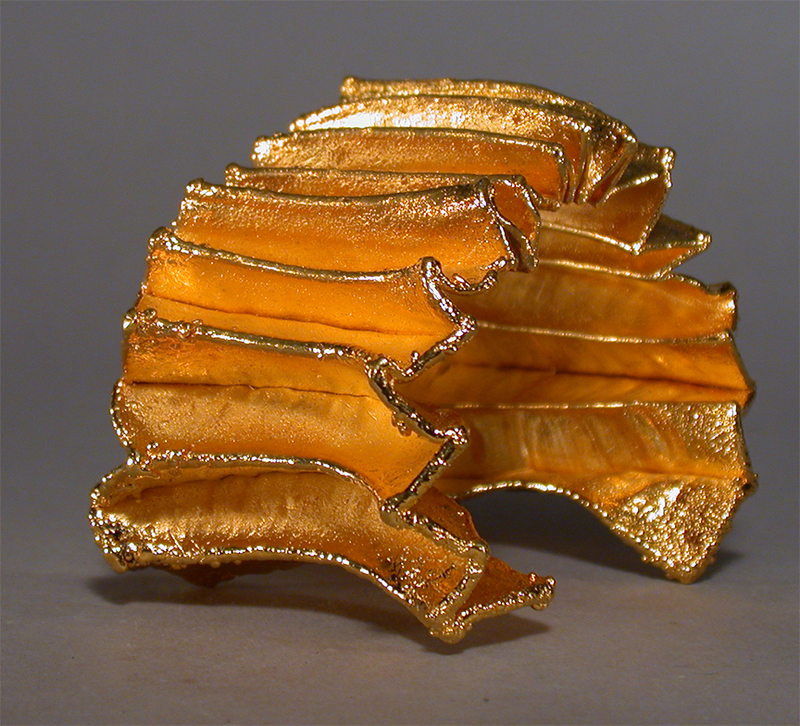 Fold-forming uses sheet material, folds it, works it and then unfolds it. Many schools and workshops teach and use fold-forming, and thousands of people use parts of the system in their work. There is a foldforming CDROM compilation of all the fold-forms. Alan Revere's comments on Lewton-Brain are here. A description of hammers and other tools for fold-forming is here. A tool list at the Ganoksin Project. 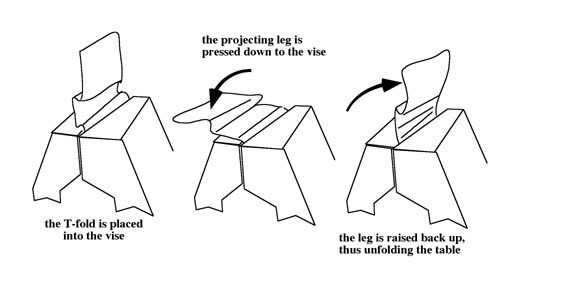 Some step by step articles on making fold-forms are here. (Examples from the CDROM). Works by Lewton-Brain available to purchase are Here. The international Foldforming competition invites entries and shared examples of foldforms: http://www.foldforming.org/. 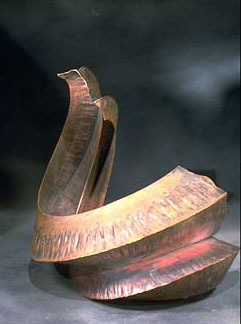 Ruffled Boat form forged on the open side. 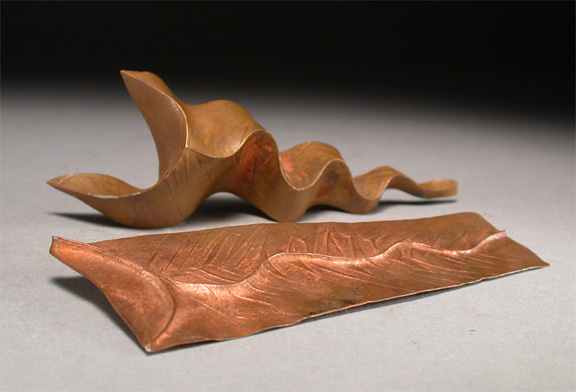 Fold forming is a new system of metal forming developed between 1980 and the present which is the concrete result of a conceptual approach to metalsmithing that emphasizes forming using the metals characteristics. It is about following what the metal likes to do. Rather than forcing form upon the material forms are to some extent derived from the natural tendencies of the plasticity, ductility and elasticity of the metal. Sheared and formed star folds. The British Museum Research Lab and the Rolex Awards for Enterprise, among others have certified that Fold-forming is new, and has not been done before in the history of metal working. 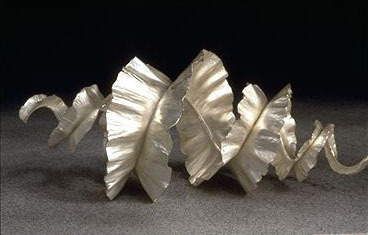 A pile of pleated folds, each made from a single sheet. Because one does not fight the metal or force form upon it forming is extremely efficient and very rapid (many radical changes in cross section and surface can be made in 3-5 minutes). 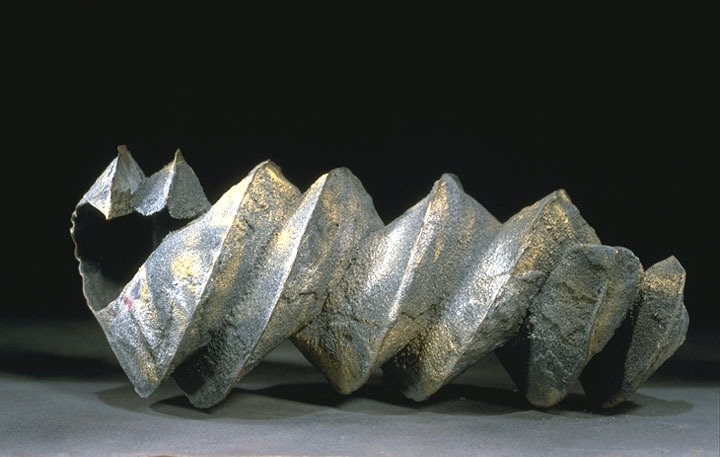 Complex high relief forms are produced from single sheets of metal often with a single annealing. Tools are simple; fingers, hands, hammers, mallets, anvils and rolling mills. 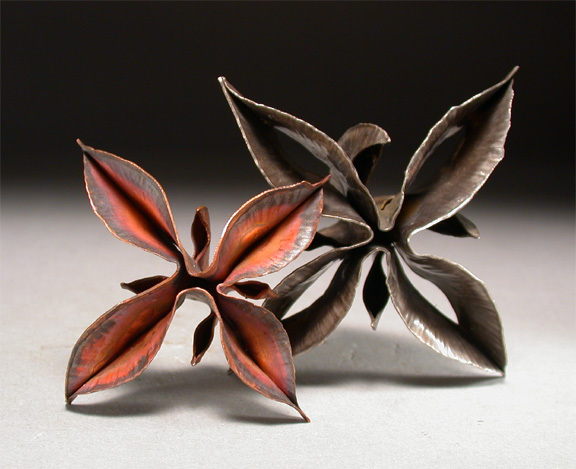 Fold forming allows rapid understanding of metal flow to take place and teaches a kind of material comprehension that often takes years to arrive at under traditional metals educational systems. Romero fold (a type of T-fold). 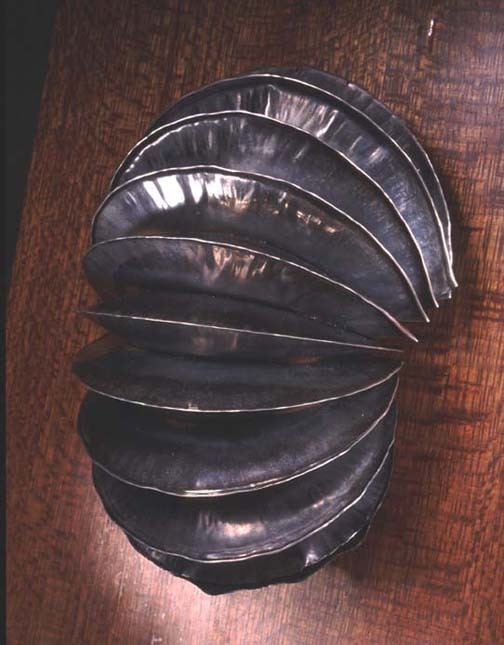 Bowl form using T-folds and cross-folds to gather the metal. 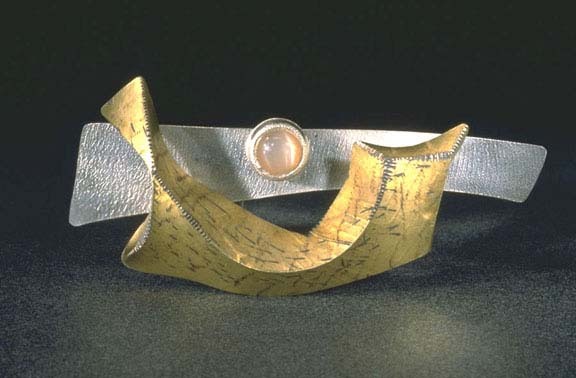 Bowl from two fold-formed discs soldered together. Scored and bent folds, two stages. One is scored and bent using separating discs and the other has been soldered after scoring and then flattened out. As a result of this approach there is a certain beauty lent to forms produced this way as the working processes are very close to the nature of the material. There is a reflection of natural laws in the results; modeling of nature is often apparent in fold forms. 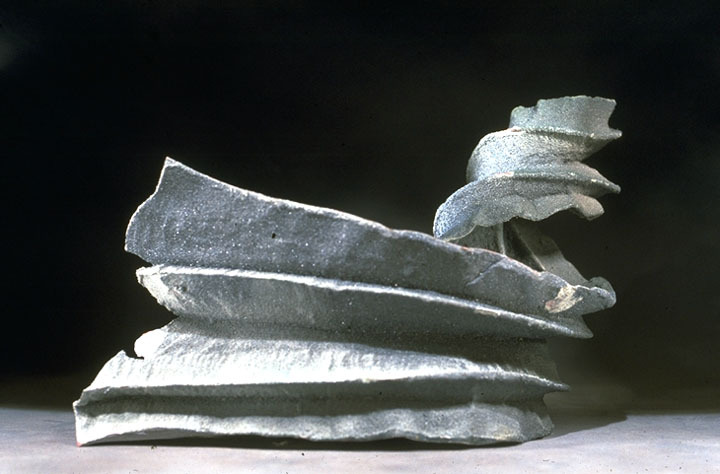 A chased wedge T-fold which has then been die formed, flattening textures while shaping and doming it. The Rolex Awards for Enterprise 1990 Committee chose a project on the further development of fold forming for inclusion in "The Rolex Awards for Enterprise" book on international innovative developments in science and invention. 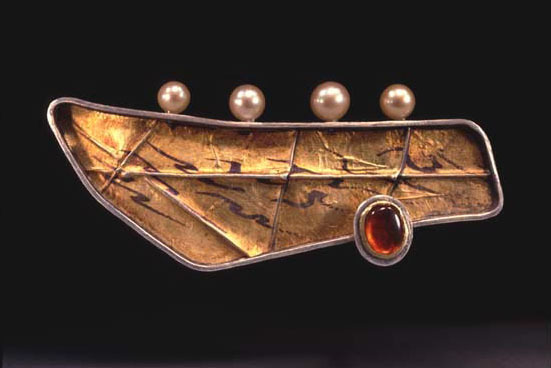 Pin, 18k gold, pearls, garnet, line folds. Pin, Swoop Series, moonstone, 24k, 18k doublee, sterling, scored and bent. 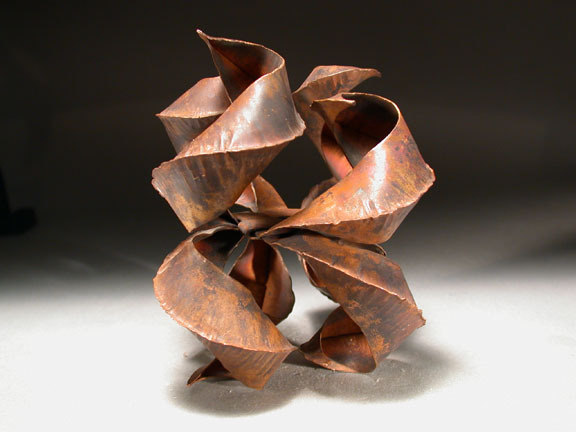 "Tennessee fold Form", forged from a single sheet, 2.5 feet across. 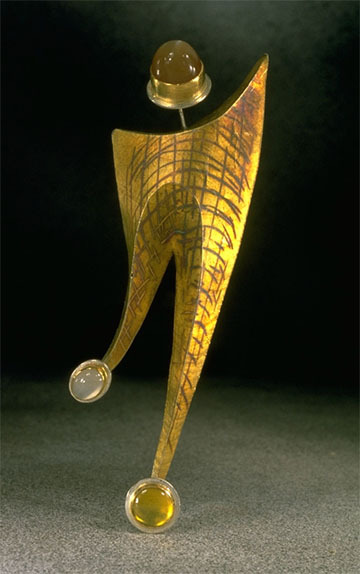 "Dancing pin", moonstones, zircon, 18k gold doublee. Scored and bent. 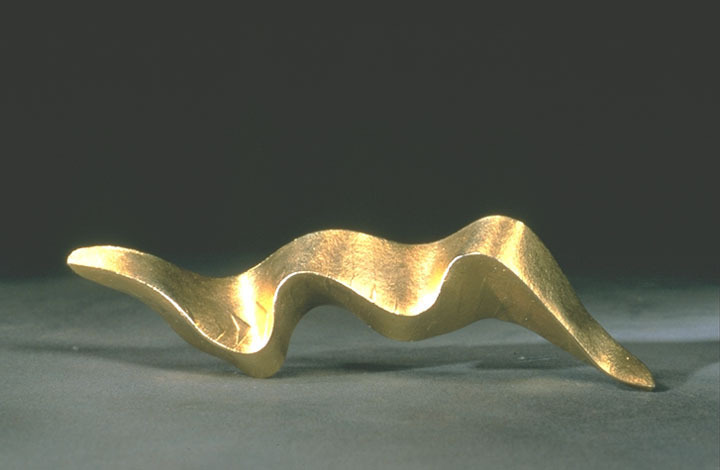 "Snake", copper, gold plate, scored and bent. 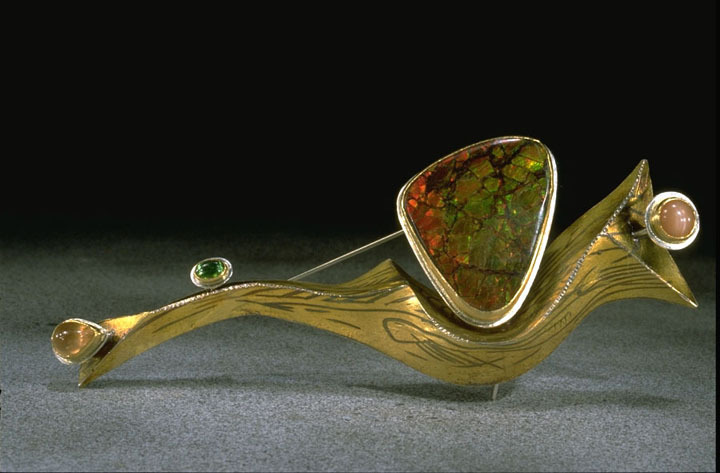 Pin, ammolite, 24k gold, moonstones, zircon, 18k doublee, sterling, scored/bent. "I believe in Beauty, and that beauty is related to nature (form, surface texture, colour) for most humans. I play with the tension between nature and structure." "Allowing the nature of the materials to do the work, deliberately building in some randomness, letting nature show in the work lends it a beauty that I cannot easily reach by forcing form onto the material." "The poignancy of humans laying structure upon the universe, of our need to create and seek pattern intrigues me, and is part of the work." "The roles and relationships of human and nature, human and perceived reality are of interest to me." "The marks of process are compositional elements. The effects of chaos (nature) on systems is something I work with." 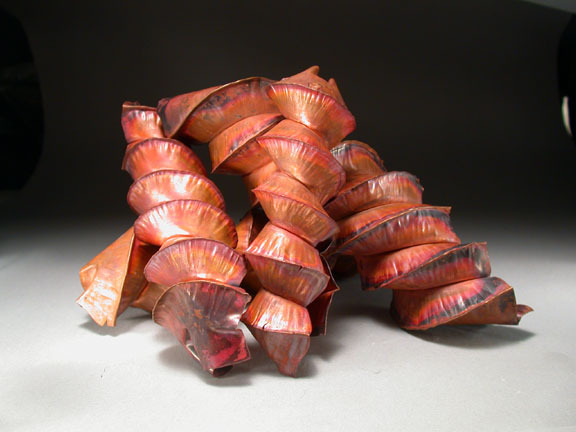 "Fold-forming lets me see directly into nature, into the relationships between process and material. 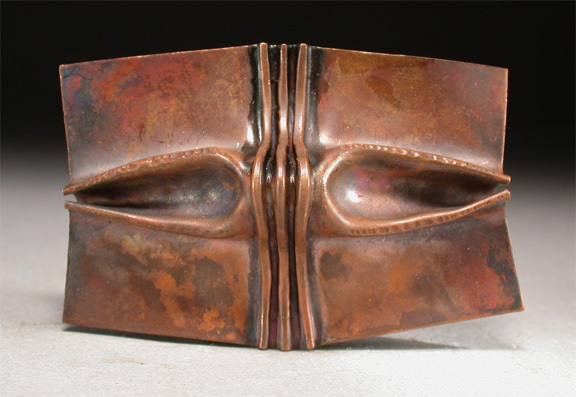 The forms that emerge from the material are truly magical." "Cactus", wall mounted piece, sterling silver, 8" high. Pleated fold. Fold forms while they are lovely as finished products are often at their best as a starting point or component of more complex pieces. An example of this might be slicing up a fold form, manipulating the elements and re-soldering, or using it as an element in a constructed structure. By chasing on air in a T-folding technique hours may be cut from a chasing procedure. Fold forming also offers a major new series of procedures for production work. A number of production shops now use fold forming as part of their working vocabulary. There are dozens of schools worldwide that teach parts of foldforming in their curriculum. Thousands of people use the procedures in their work, and to make a living. Fold forms themselves have developed a great deal since 1985. There are now a number of discrete avenues of research available involving folding, working and unfolding. Each avenue provides great numbers of individual 'marks' or process elements that are distinct enough to be worthy of naming. These are arrived at by following specific procedures, recipes that produce given results. By making a number of fold forms and experimenting an understanding of process in metal forming is achieved more rapidly than in conventional working methods.